When Jocelyn told us that there was a very, very big duck on the side of the road in Flanders, we weren’t sure what to expect… Turns out, it’s exactly just that! 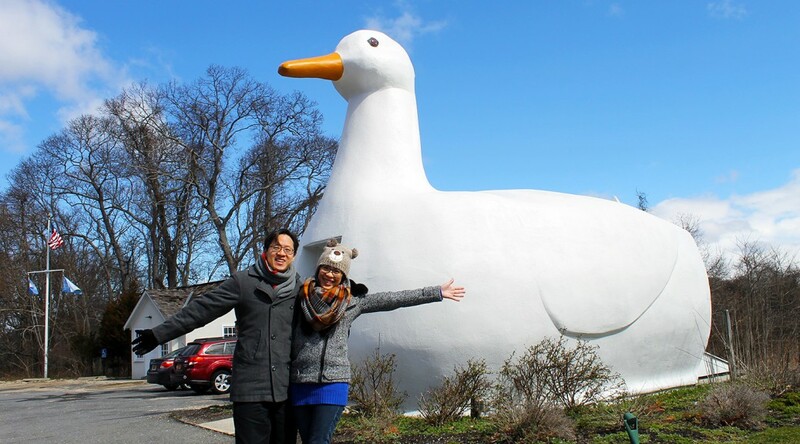 We stopped by The Big Duck during our exploration of Long Island with Jocelyn, Matt, and Yuri. It’s reminiscent of other wacky roadside attractions we’ve seen previously, such as Lucy the Elephant near Atlantic City. In the 1930s as automobile travel increased, novelty architecture such as these became widespread in attempts to draw motorists and tourists. Specifically, mimic architecture was popular: Structures were built in the shape of the product being sold to attract potential customers. 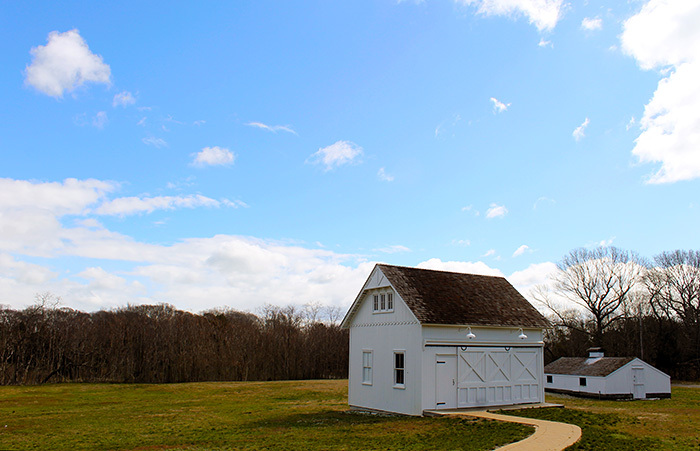 Unfortunately, only a few of the whimsical buildings from that era of American history have been preserved. Now, they’re mostly oddities and tourist attractions. 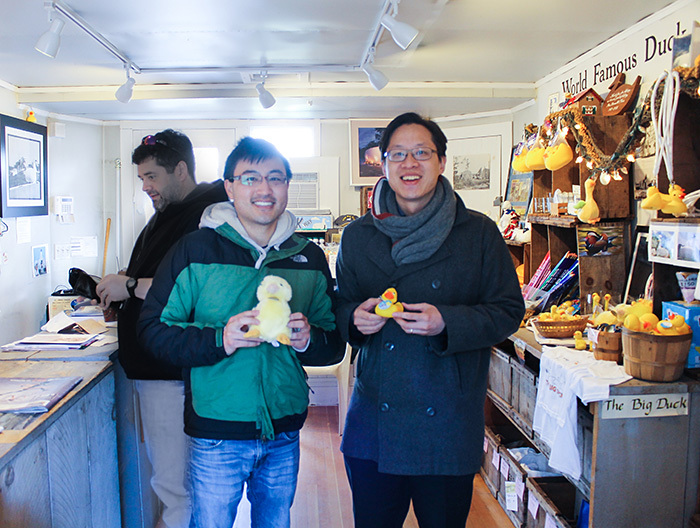 At the peak of the novelty architecture movement, farmers Martin and Jeule Maurer built The Big Duck on Main Street of Riverhead in 1931. Later, it was moved four miles to Flanders, then somewhere else, then back to its spot in Flanders. It’s a ferrocement building, which means that it is made of thin-walled concrete applied over wire mesh, held up by a wooden frame about 15ft wide x 30ft long x 20ft tall. It was modeled after the Maurers’ product, the American Pekin (not Peking) duck, complete with Ford Model T tail lights for eyes that glow red at night! In Flanders, The Big Duck in its prime location watched over the booming Long Island industry of duck farming, which included the Maurers’ own duck ranch, very unoriginally entitled The Big Duck Ranch. Ducks, duck eggs, and other duck products were sold out of the colossal duck until the mid-1980s. Even when the business inside became defunct, the residents of Flanders rallied to preserve the quirky structure as a landmark. As of 1997, The Big Duck is listed on the National Register of Historic Places (The Big Duck Rank is also listed, but separately). Today it is open to the public as a gift shop and tourist information center for the Long Island Convention and Visitors Bureau… which brings us back to our visit! The entrance to The Big Duck was at its chest under its bill. The inside is a cozy 3.5m x 4.5m and is stocked with duck memorabilia of all kinds. Here are Matt and Silas modeling some of them. If you’re ever on Route 24 in Flanders, make sure to stop by! P.S. We saw and did lots of great things on our exploration of Long Island – Montauk, classic apple pies, and even a bite-sized lesson in American history. Read about our visit to Sagamore Hill (and Teddy Roosevelt) by clicking here.